← Gluten Free Bride- Bridal shower bliss! thank you for this. I just bought a groupon for the 3day skinny cleanse and I was wondering what I was getting into. this was very helpful and I am now excited to try it! I just got the cleanse yesterday, and I’m starting it tomorrow. Your experience is helpful. 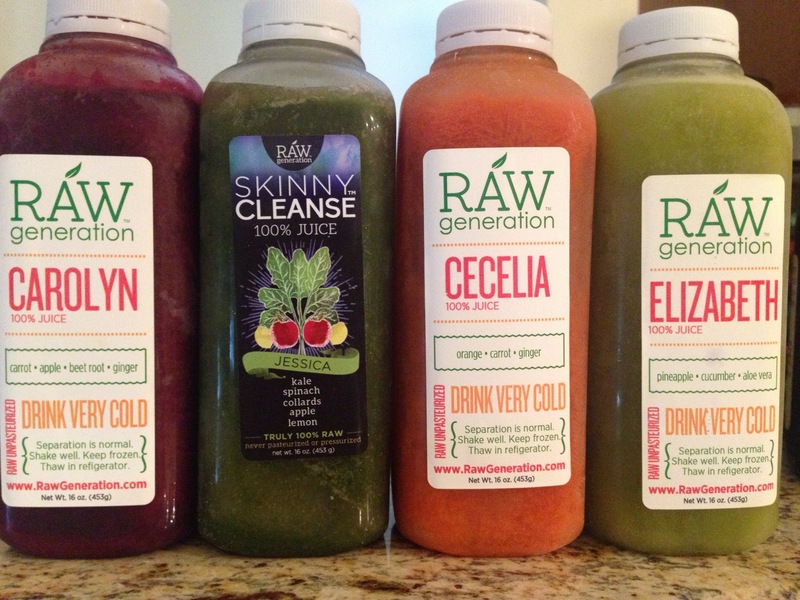 Hopefully you made it through the cleanse! Woke up day 1 on 2/5 nervous but excited. At least it’s SNOWING!! 5:30a: Drank coffee with almond milk. I’m sorry, but black coffee is too gross. 6:30a: Here we go!! Drank #1 – was pleased how yummy it was. Mostly it tasted like apple juice. It took almost an hour to drink because it was so cold, but it was tasty the entire time. There is a lot of juice, so it is somewhat filling but not entirely. It did turn my tongue green though!! 7:45a: Cold and a little hungry, having a hot fruit decaf tea to warm me up. Drinking lots of water too. Have a little headache – not sure if it’s hunger or just mental. 8:30a: I’m pretty hungry. #2 is orange but has a very strong ginger flavor, not my favorite root. But I’m drinking it. This one is more thawed so luckily it’s going down faster. Finished it in ten minutes but my mouth tastes like ginger. Maybe I’ll try adding more lemon juice to it tomorrow. My head is pounding with a headache too. I am normally really focused on protein intake & I wonder if that is the problem. 10:30a: At least #3 is back to greens & apple based with NO ginger. It tastes really good and I finished it really quickly. Time to shovel snow. 1:00p: It’s 1pm and I’m not that hungry?? And my headache is reduced a little? Wow! I am amazed. I am nibbling on a salad of mixed greens, ½ apple, ½ orange pepper, and a few carrots and drinking #4. Not being a huge beet fan, it’s not awesome but I like it more than ginger-power #2… Choked it down but didn’t love it. 4:00p: Between snow blowers and trips to the airport I never even finished my salad! Nibbling on it now. 6:30p: Finished #5. It was a little pasty towards the end but good flavor. 7:30p: I’m a little hungry, but fortunately we are early to bed early to rise people, so I’m going to sleep soon. I guess I did skip #6, but I ate a salad so I didn’t think I should drink it. 6:30a: I feel refreshed and pretty good. Wow, I can’t believe I survived a day with no protein. But about 20 minutes later I started really dragging. I’m going to drink shake #1 and my coffee and see how it goes. 8:00a: After #1 and coffee, and an hour on the couch, I feel good again. Making breakfast for my daughter was a little painful – not being able to eat any of it! Oh well, some things require perseverance. Mid-morning – perseverance is needed as my tummy is NOT happy. A few episodes of diarrhea are announcing this!! 9:00a: Drinking #2 – oh that ginger is so overwhelming still…. But it’s alright and it’s giving me some stamina. 11:30a: Drank #3 and it takes so good still. Each of them are making me so very cold though. The snow on the streets has melted and we are heading out to run some errands. Hopefully I won’t be impatient and hangry. 2:30p: With going to various stores, I’m a bit late on this one. Even the 10 baby carrots I brought didn’t help me out. The beet juice in #4 is certainly not a mixture I’m going to create in my own smoothies. I’m really hungry and getting a little cranky. Sorry daughter! 4:30p: We are done shopping, my daughter has had an early dinner, and we are playing a game. I’m drinking #5 and glad it has good flavor. 6:30p: I’m eating a huge salad with just lettuce, carrots, peppers, and apple. It’s helping…. 7:30p: My stomach is growling. I don’t have a shake thawed so I’m just going to bed hungry! 6:00a: I think I can, I think I can….. I have energy and feel refreshed. But after a shower and starting a load of laundry, I am totally out of energy again. I’m so glad I didn’t try to do this when I was going into the office. Definitely best to do over a long weekend. 6:30a: #1 and coffee are doing the trick. Starting to feel better almost within minutes. Maybe it’s just mental! I’m going to have ½ a grapefruit with my daughter as well. 8:30a: I’m going to stay totally on schedule today. I’m choking down #2 ginger-fest and glad it’s my last one! 10:30a: Driving to the airport to pick up my husband and son – drinking #3 right on schedule. I’m pretty hungry but still impressed my body can survive on juice and veggies alone! 12:30p: Driving back from some more errands. Drinking (choking down) #4 beet juice. Also sad this is the last one of these. If I do this again, I’m going to try to order #1, 3, 5, 6…. 2:30p: Like I said, I’m not deviating from a strict schedule today. We are having friends over for dinner and I don’t want to be hangry mad. I can have a big salad while they are eating, it will just be the wine I will have to miss out on! So, I’m drinking #5 and looking forward to tomorrow. I’m not sure what food I’m going to add back, but I think I’m going to try to go Paleo: fruits, veggies, meat, eggs for the week. The following week is winter break and we are meeting friends for skiing – not holding back on the wine then, so I need to do my best between now and then!! ps – I really didn’t tell my husband I am doing this. He has seen me drinking the juices, but since he was gone most of the weekend, he hasn’t seen me “skip”meals yet. Hopefully I can just get through the salad tonight and he will be none the wiser all through! 3:30p: I started making my own shakes/smoothies/whatever they are called. I totally don’t know what I’m doing, but I put apples and carrots through the food processor and then the blender with lemon juice. I kept about half of the solids and strained the rest into a big bowl. I used that juice to blend spinach, and man that doesn’t smell too good…. If you use Kale or Collards, cut out the center stem as it really puts a hurt on a regular blender. (I don’t have a fancy juicer!) After two rounds of everything and adding two pears as well, I ended up keeping the fruit and carrot solids and straining the greens through a really fine strainer. The solids of the greens seemed so stringy I wasn’t sure I could drink them. I used A LOT of lemon juice to get everything through the blender and kept using the strained juice as well to get the greens to blend. But in the end it tasted just like #3!!! How cool is that?? Mine is a little chunkier – I guess if I had a juicer it might be finer, but maybe it will feel like more of a meal this way. I even washed out the bottles from RawGen, so I’m using that to freeze my own juice. We’ll see what it tastes like tomorrow. 4:30p: I had already gotten #6 out, so I drank that even though I had made a bucket load of my own juice. The cucumber is ok and the pineapple makes it tolerable. I’ve almost made it. 6:30p: We have friends over for superbowl and I’m not eating the food I cooked or drinking wine! I’m just a lot proud of myself. Ok, I did add grilled zucchini and pepper to my salad, but those are veggies and I didn’t put any oil on them – just grilled with salt & pepper! Ate a lot of salad. No bread, no cookies, no wine!!! I MADE IT!!! It’s 8:30p and I’m going to bed. Decided to add grilled chicken to my salads for dinner for the week and have eggs with veggies for breakfast. Going to try to stick to shakes and fruit/veggies for lunch and snacks. No alcohol either. Next week is winter break…. MONDAY AM – the proof is in the scale! Down 6 pounds!! !